Picking up a car from 700 miles away. My current vehicles have a 3500lb limit, so that won’t work for me. 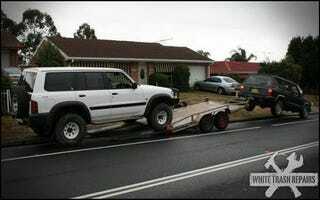 Looking to pick up a CHEAP tow rig for $2,000 or less. Needs a tow rating of at least 6,000# (2,000lb for the uhaul flatbed, 3600lb for the car). Not looking to keep it long term, plan to make the trip and then flip the vehicle for some profit. What are some good choices for a quick flip 1400 mile tow expedition?